The global influenza epidemic that killed millions of people worldwide in 1918-19, including thousands of North American Indians and Alaska Natives, was the tragic inspiration behind a revolutionary new tradition of healing that emerged in Ojibwe communities of the United States and Canada, the jingle dress dance. 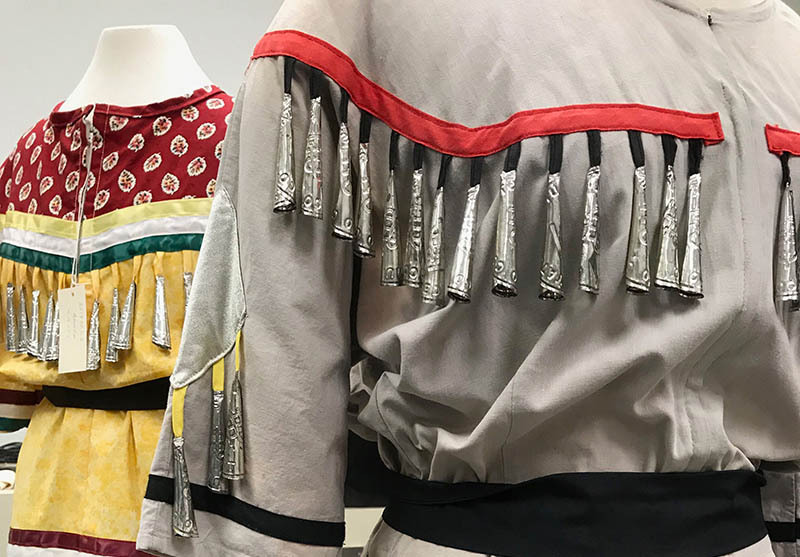 Through photographs, oral tradition, and a display of jingle dresses from the MNHS collections, visitors will learn about the jingle dress dance and how its origin can be traced to the Mille Lacs Ojibwe. The exhibit commemorates the epidemic and the 100th anniversary of the jingle dress dance. It is being developed in partnership with the University of Minnesota Department of American Studies and the Mille Lacs Ojibwe community. Immerse yourself in the proud and tumultuous history of the Mille Lacs Band of Ojibwe. Journey through the story of the band, from the time of their settlement in Northern Minnesota, through a period of treaties made and broken, and up to the present. The museum illustrates the history of the Mille Lacs Band of Ojibwe and the contemporary issues that surround them. To emphasize the continuing importance of language in contemporary Ojibwe culture, exhibit text incorporates both Ojibwe and English. The displays feature arts and crafts of the Ojibwe people, as well as puzzles, loom beading activities, and an interactive Ojibwe language game for kids. The museum is open to the general public April through October. The centerpiece of the museum is the dramatic "Four Seasons Room," which features life-sized dioramas modeled after actual Mille Lacs Band members. The exhibits draw heavily on the personal stories and oral histories of Mille Lacs Band members. The dioramas in the current Four Seasons Room were installed in the old museum in 1964, and life-cast mannequins were added in 1972. Then in 1996, the dioramas and mannequins were incorporated into an enhanced setting in the new museum’s Four Seasons Room. Throughout the years, the display has been praised by visitors and has become a source of pride for many Ojibwe people who helped to build and equip the room, and who posed for the life-sized figures. 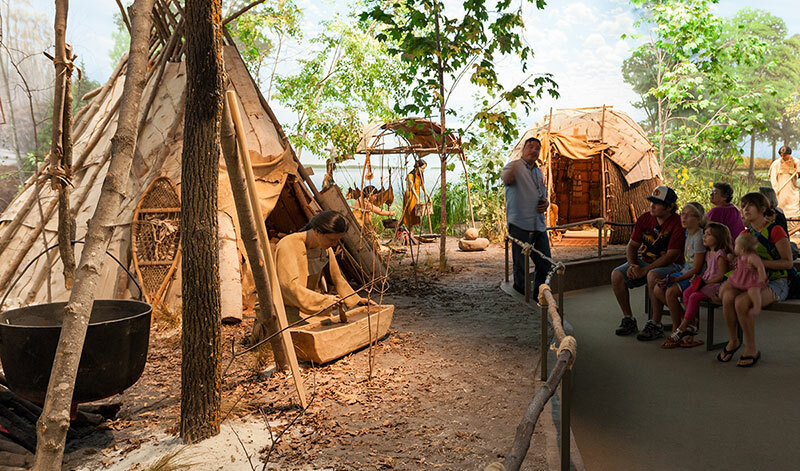 The dioramas illustrate traditional activities of Mille Lacs Band members throughout the seasons, from the spring maple syrup camp, to the fishing and berry gathering of the summer months, to fall wild ricing, to winter hunting and trapping. This exhibit displays an array of stunning contemporary powwow outfits and related activities. Learn about the many ways Ojibwe people have endured economically through the past century. Explore how the people of Mille Lacs have asserted the rights of sovereignty and self-governance. The exhibits showcase objects from the Ayer Collection, a collection of Mille Lacs Band of Ojibwe crafts. A changing display highlights objects from the 2,200-piece collection, including bandolier bags, moccasins, and birch bark baskets. The objects were collected by Harry and Jeanette Ayer, who ran a fishing resort and trading post on the site from 1918 to 1958. The museum includes a spacious crafts room, which serves as a training and demonstration area for beadwork, birch bark basketry, basswood dyeing, embroidery, and traditional cooking. The crafts room connects to an outdoor program area featuring demonstrations of wild ricing, maple sugar processing, traditional dancing, and tipi and canoe building. The museum also has classroom/meeting space for rental and outside picnic areas that overlook beautiful Mille Lacs Lake. The museum was the product of a partnership between the Minnesota Historical Society and the Mille Lacs Band of Ojibwe. Both groups worked together to select a location, an architectural firm, and the content of the exhibits. As a result, the expectations successfully merged in a museum designed to conserve precious artifacts and incorporate the beauty of its setting to tell the band's history. The museum opened in May 1996. Fashioned in cedar and other traditional north woods materials, the exterior is highlighted with a copper dome and corrugated copper columns. An inset tile belt of blue oak leaves, designed by Mille Lacs elder Batiste Sam, was based on a beaded belt featured in the museum. The architects designed the building to acknowledge its environment, with the building's arching window wall reflecting the shoreline of Lake Mille Lacs.